Used to be just Qlik stuff but now pretty much anything Data is in scope. Colour is an important variable to consider when designing a visualisation. 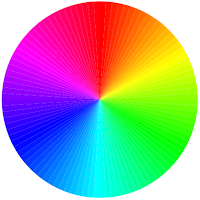 A lot of Qlik developers, if we think of it at all, will think of colour in terms of a mix of red, green and blue - each of them usually as a numeric value between 0 and 255. A lot of web developers will think hexadecimally - #00 to #ff, with the R/G/B being expressed as a hex number like #00df87. There is another way to think of colour, especially when thinking about how to represent scales, and that is to consider hue, saturation and luminosity. In QlikView, the HSL function takes a value between 0 and 1 for the hue. 0 is pure red, 0.33 is pure green and 0.67 is pure blue. A changing hue is used by some designers to represent a scale - the so-called "rainbow scale". However, this is wrong on a number of levels. Not least of these is that there is no well accepted norm to say that red is low while blue is high and green is in the middle. Of course, we also have to remember the we need to design visualisations that may be used by people with colour blindness. Therefore, if you are representing a single climbing or falling scale, you should really just stick to a single hue value. 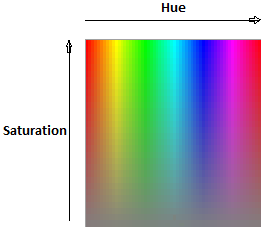 If you are creating a diverging scale, then two hue values can be used. So, why would we worry about HSL? Because they are easily programmable! In both Qlik (all of the images here are built in QlikView using the HSL() function) and web/css technologies, there is a HSL colour function that will accept a hue, saturation and luminosity value. Even better, in both cases, the saturation and luminosity values are represented by percentages - which are ideal for calculating scales. As well as holding a Master's Degree in Data Analytics, Stephen Redmond is a practicing Data Professional of over 20 years experience. He is author of Mastering QlikView - http://bit.ly/1F14EPY, the QlikView for Developers Cookbook - http://bit.ly/13AFWcO, and QlikView Server and Publisher - http://bit.ly/1hpNwcU.